If you're booking flights or accommodation, keep an eye on our dates for your diary. 2019 will see the continuation of the very popular and exciting Troupe section which we be competing for the National Title, alongside the traditional Soloist Art Forms. 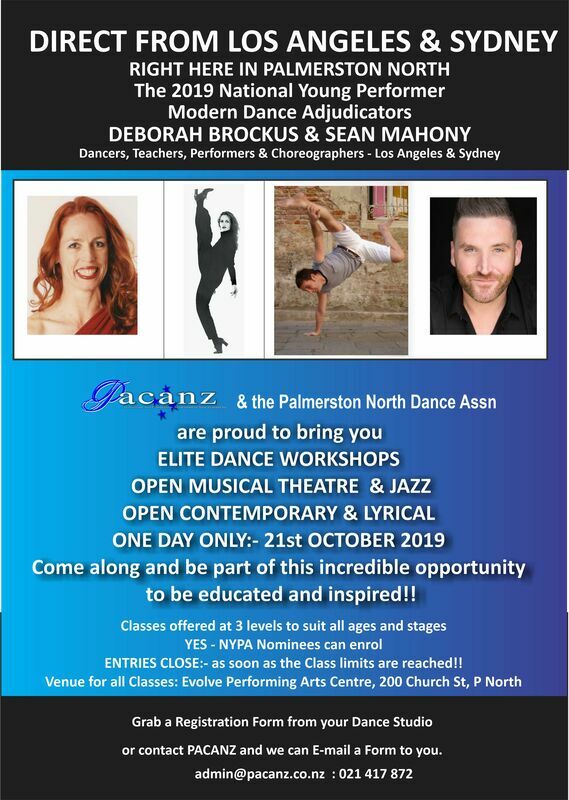 The soloists for Modern Dance, Highland Dance, Speech & Drama, and Instrumental Sections, will have registration and orientation on Friday 18th October, with the soloist competition of preliminary rounds (including masterclasses in Modern Dance) being held on Saturday 19th October and Sunday 20th October. 2019 Tickets are available now! We're taking bookings for workshops now! The Modern Dance Co- Adjudicators will run Workshops on Monday 21st October for all interested dancers and including the NYPA Nominees. Click the poster on the right to download a larger, printable PDF. © PACANZ, 2018. All rights reserved.